Why Is Almond Milk Better for You than Regular Milk? Regular milk (even skim or low-fat) still has quite a bit of sugar. I try to keep my grams of sugar under 5-6 grams per meal and 35 grams per day. I noticed that once I made this change the extra fat on my tummy really started to go away. Instead of milk, I use almond milk. I like the Almond Breeze unsweetened vanilla (40 calories per cup and no sugar). The Silk brand is pretty good too, but I prefer mine to be a little sweet with the vanilla flavor. Just make sure you don’t get the 90 calorie vanilla one (it has sugar added to it, the 40 calorie one just has vanilla extract added). I use almond milk every day in my coffee, protein shakes, frozen egg whites, and I sub it for any recipe calling for milk. If you have a nut allergy you can use coconut milk or rice milk. You get it by the milk in the refrigerated section of your grocery store. Almond Milk stays good in your fridge for a while, so many times grocery stores will have it on sale 2/$5 and I buy a few and stock up. I used to put 2 tbsp of half and half in my coffee every day (and I usually have two cups, so that is actually 4 Tbsp a day). But, if you can sub almond milk for your creamer you can cut a lot of fat and calories out of your diet. -2 Tbsp of Half and Half has appx. 45 calories, 2g carbs and 4g of fat. -2 Tbsp of almond milk has appx 5 calories, .3g carbs and .4g protein. If you subbed almond milk for half and half every day for one year (assuming you were drinking two cups a day) you could cut out over 29,000 calories! That’s over 8 lbs you could lose in one year just by making this easy switch. Have you tried almond milk? Do you like it? I LOVE Almond Milk! I am semi-lactose intolerant and grew up that way so I’ve never even really liked the taste of milk or soy milk but I do love the Almond- I’m so glad I found it this past year! I agree! I had no clue it even existed until a few months ago. Glad to see more stores are carrying the unsweetened vanilla kind too. We just recently moved to Korea and I am having a heck of a time finding all of the good foods I had in Alabama. Our grocery store is extremely limited and it is a bit discouraging trying to find the things I need. 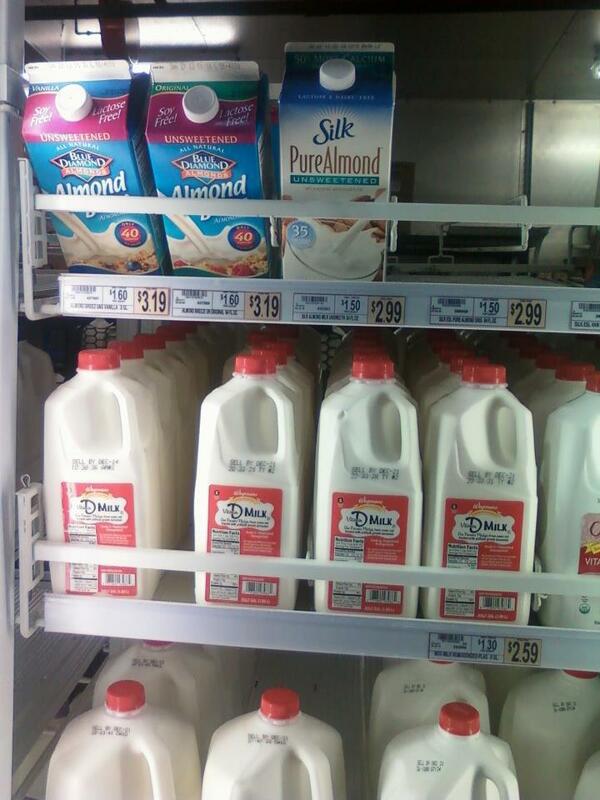 I loved the half gallons of unsweetened vanilla almond milk I could find in the states but they don’t have it here. I did find the smaller non refrigerated cartons of the regular unsweetened almond milk in the middle isles of the store so I’ve been stocking up on those. I can add my own vanilla! Oh man! I can’t even imagine living overseas and the limitations you would have. Are you with the military? Yes, my husband is in the Army…the kids and I are just along for the ride! There is a pretty nice market in town on certain days that is a great place to buy cheap veggies though so that works out for us. Our little store on post didn’t even have yogurt for a couple months. Right now they’re stocked but no Greek. I’ve just been buying the regular plain fat free yogurt. I have a question. How do you keep your sugars to 35g per day? If I were to have fruit 3x’s a day, it seems I can’t get my sugars to that point. How much fruit do you eat in a day? Thank you! Hey Rachel! I don’t eat much fruit. I usually have 1/4 cup blueberries in the morning with my oats and I might have 1/2 an apple or 1/2 a banana post workout, but that’s about it. I used to eat a TON of fruit, but I found that once I really started to focus on keeping my grams of sugar low I saw big changes – especially in my belly fat area. I’ve been hearing about almond milk for a while and kept thinking I should try it. I finally bought some a week ago and since then have started Jamie Eason’s program — so glad I bought that milk! I really like the taste and consistency of the Almond Breeze unsweetened version. I found it at the Acme, so it’s easy to find here, thank goodness. I just tried the almond milk. Original unsweetened but it is pretty good. I’m trying to lose weight. So I’m thinking of switching from regular milk to the almond milk. I’ve never tried it before and it leaves a nutty after taste but I think I might like the vanilla unsweetened instead of what I got now. I make my own almond milk, it’s easy and that way I have no added anything. I do add 6 to 7 drops of liquid stevia (that is made without alcohol) to sweeten. It lasts 1 week, so I only make a week’s worth at a time. It does need to be stirred before each use as there is some settling. I use the left over almond mash in a keto cracker recipe. Nothing wasted.